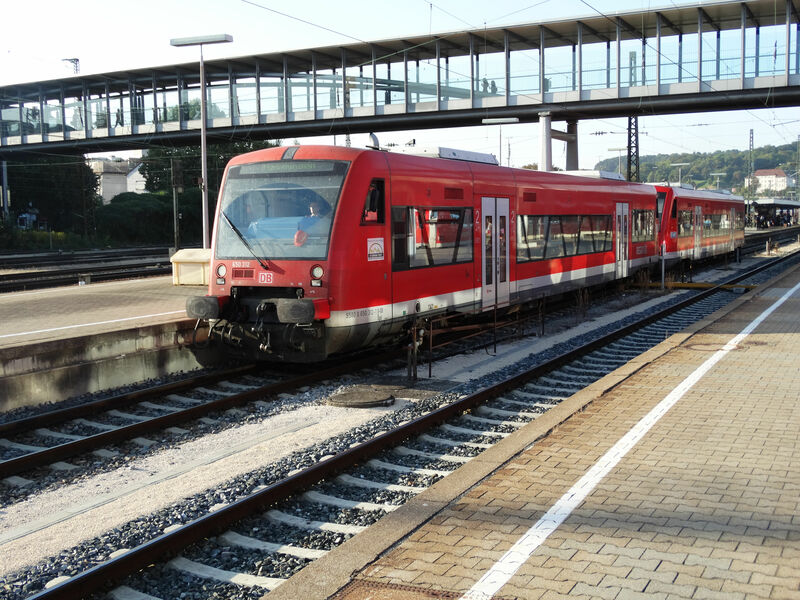 There are still quite a lot of unelectrified rail lines in Germany where diesel traction is needed. This section of our archive shows DB's diesel railbuses and diesel multiple units. Our first picture shows one of the very newest DMUs, a class 620 three coach train of the "Vareo" service. 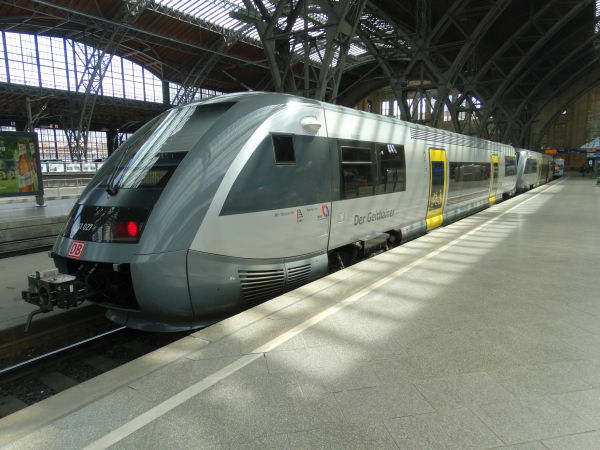 Class 620 comes from the French company Alstom and it is Alstom's type Coradia LINT 81. Picture at Trier main station 18.12.2016 by Ilkka Siissalo. 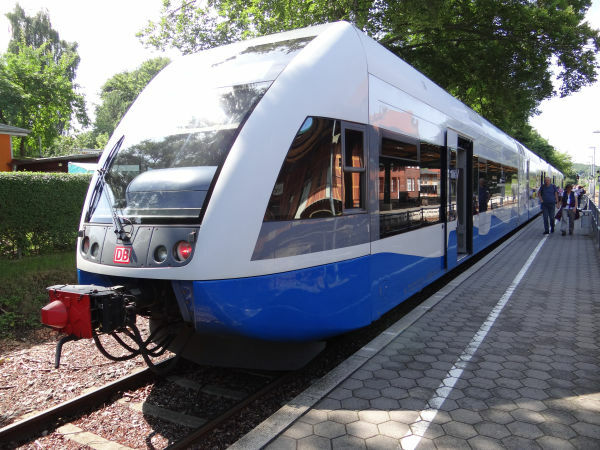 Alstom Coradia LINT railbuses are available also as one coach variants called LINT 27 or Br640. Picture of a Br640 railbus is from Braunschweig 17.7.2018 by Ilkka Siissalo. Another view of two class Br640 railbuses. Picture from Braunschweig 17.7.2018 by Ilkka Siissalo. This is a class 628 diesel railbus, but not painted red as usual, but instead in the "long distance train colours" and named "Sylt Shuttle Plus". 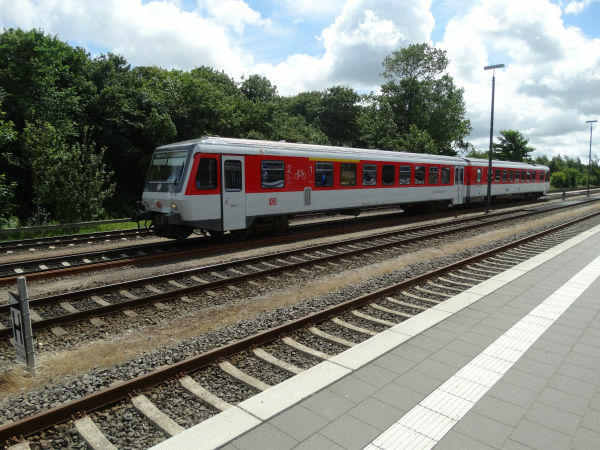 There is only a train connection between the mainland and the island of Sylt. 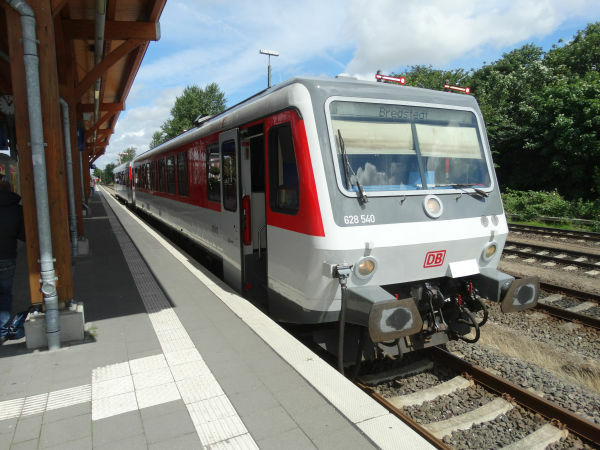 Cars are transported by train and DB runs there a service called Sylt Shuttle between Niebüll on the mainland and Westerland on the island. But in 2015 it was announced that there would be a new competitor for DB in this profitable traffic. 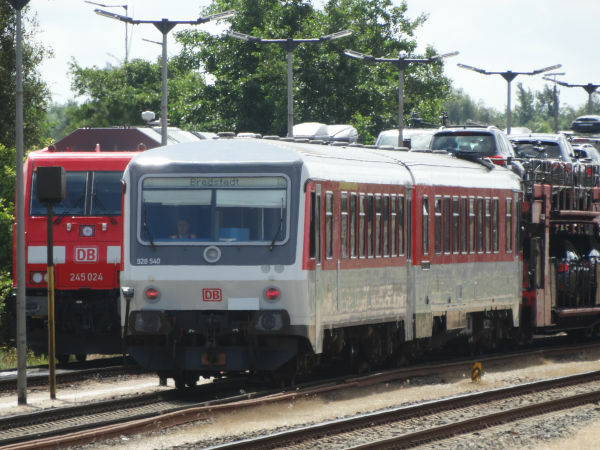 To block the competitor from gaining access to the rail slots, DB added to its Sylt Shuttle trains these two coach old railbuses, which would run combined with the car shuttle trains between Niebüll and Westerland, but which are then detached at Niebüll and continue as "long distance trains" or "express trains" further inland to the town of Bredstedt. 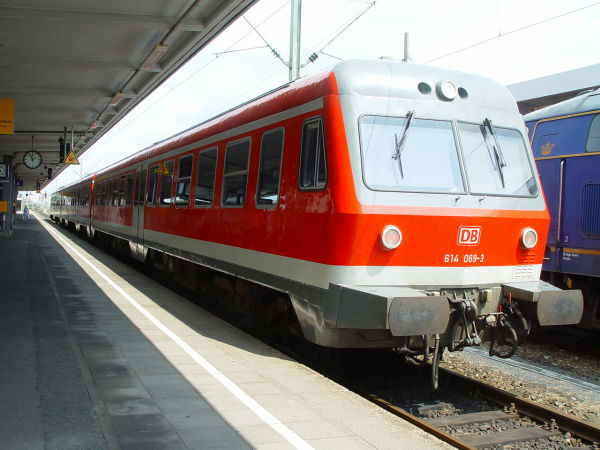 This is a slow and useless service and almost nobody needs to use it, but it allowed DB to classify its Sylt Shuttle trains as valuable long distance passenger express trains, which have priority over a potential competitor's car shuttle trains. A dirty trick - but it seems to have worked. The competitor has by the end of 2016 been able to run only a few car shuttle trains. Picture at Niebüll station 9.7.2016 by Ilkka Siissalo. 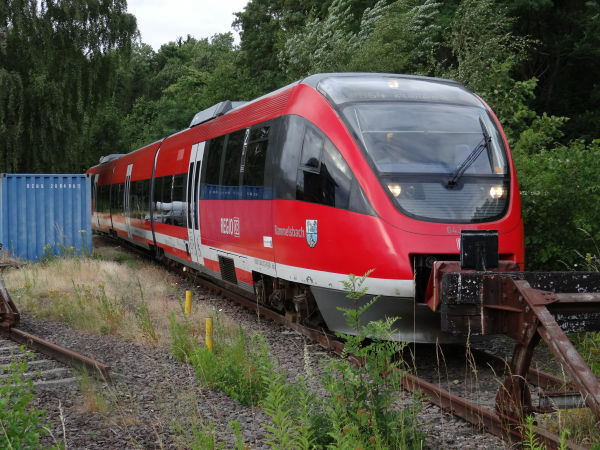 A car shuttle train has just arrived from the island of Sylt to Niebüll station and at the end of it hangs the old Br 628 railbus as "Sylt Shuttle Plus". Soon it will be detached, then it will run to the passenger platform and finally continue further inland to Bredstedt. 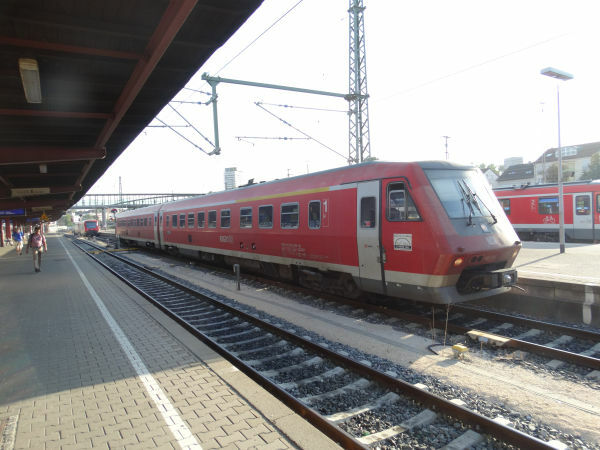 DB has masses of these old Br 628 railbuses doing nothing as they have been replaced by more modern trains, so it doesn't cost them much to waste a couple of them in this way to cause harm to a competitor. Picture at Niebüll station 9.7.2016 by Ilkka Siissalo. Here the Sylt Shuttle Plus railbus has come to the passenger platform at Niebüll and is soon ready to continue towards Bredstedt. There were only two passengers on board. Picture from Niebüll station 9.7.2016 by Ilkka Siissalo. This picture shows a real rarity. 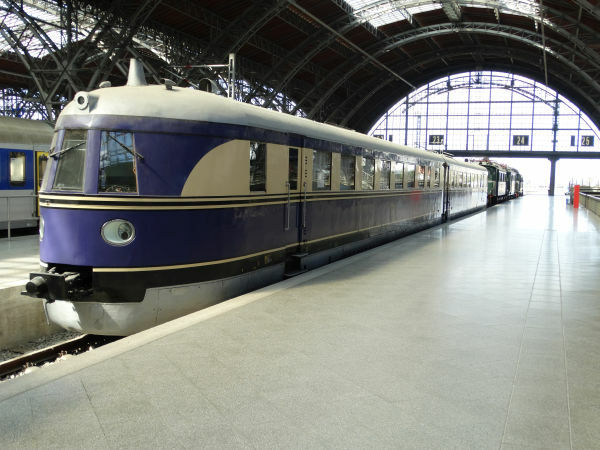 These are Alstom made French railbuses nicknamed Baleine, blue whale. 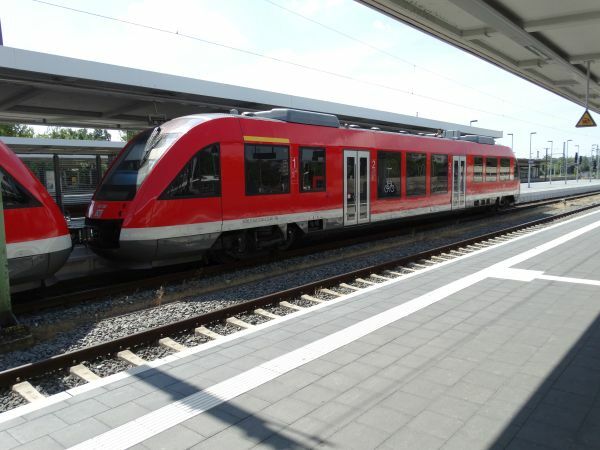 Officially the type is called Alstom Coradia A TER and DB calls in in Germany Br 641. But these two are French trains running here in Germany and one of them is in DB's red paintings, but with French SNCF's stickers, and the other one is in SNCF's blue and grey livery. 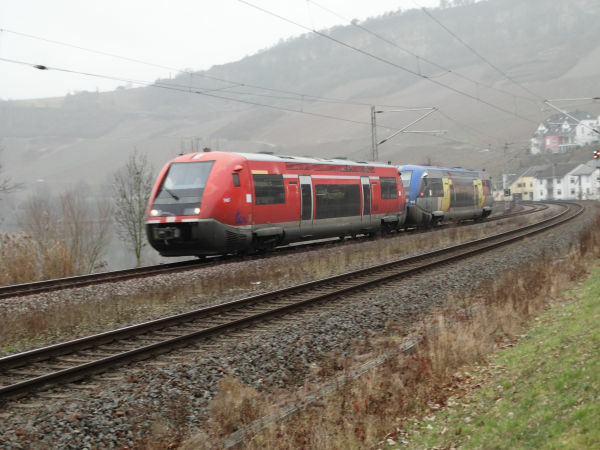 The explanation lies in an agreement between the German state of Saarland and the French administrative region of Lorraine regarding regional train traffic across the border. 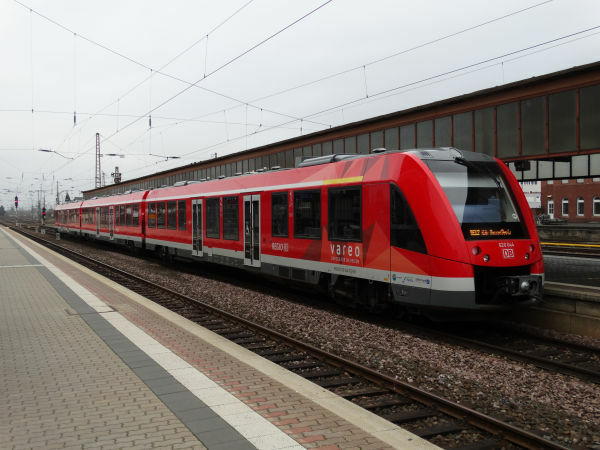 Saarland bought some of these railbuses and they were painted DB's red and SNCF bought other ones painting them in their own typical way. The red ones are officially DB's class 641 railbuses, but they all are operated and maintained by the French SNCF. Picture from the small station of Nittel by the river Mosel 17.12.2016 by Ilkka Siissalo. Some of the same "Baleines" were transferred from Basel region and from Saarland to Eastern Germany. 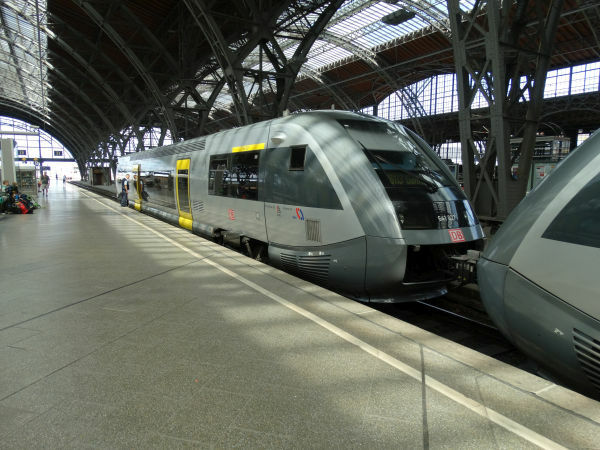 These two are in the grey regional colours of Mitteldeutschland, the S-Bahn network around Leipzig, and they have been named as "Der Geithainer" as they are connecting Geithain to Leipzig. Another view of a class Br641 "Baleine" as "Der Gaithainer" in Leipzig. This is a three coach long diesel railbus made by the company Bombardier. It is a Bombardier Talent (1st generation), class 643. 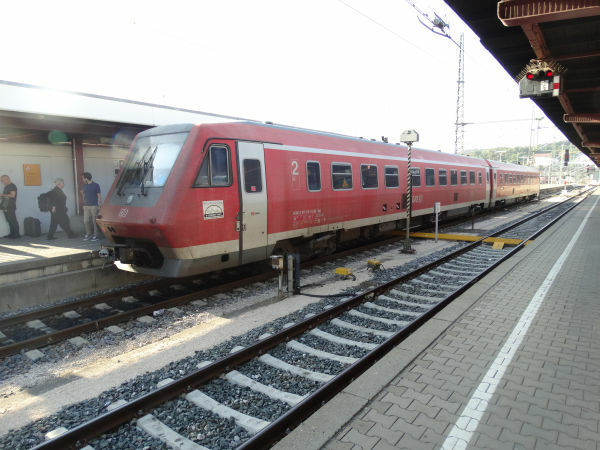 Picture from Pirmasens station 8.7.2015 by Ilkka Siissalo. Compare with the picture above. This was a competing product. This is a Siemens Desiro two coach long diesel railbus of the class 642. 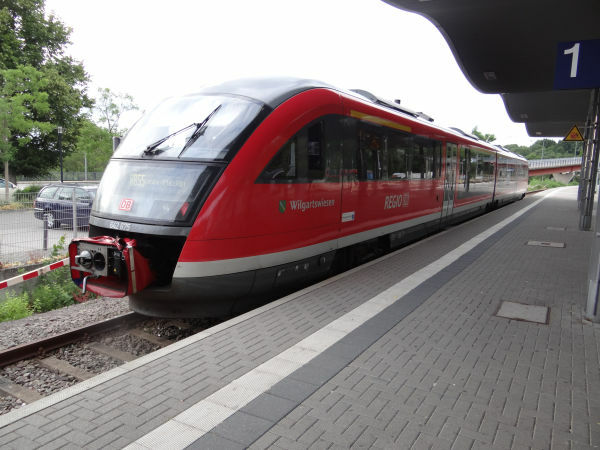 These two types are easy to mix up, but the opening at the front where the Scharfenberg coupling comes out is broader in the Siemens Desiro train, which makes it look more like "broadly smiling". 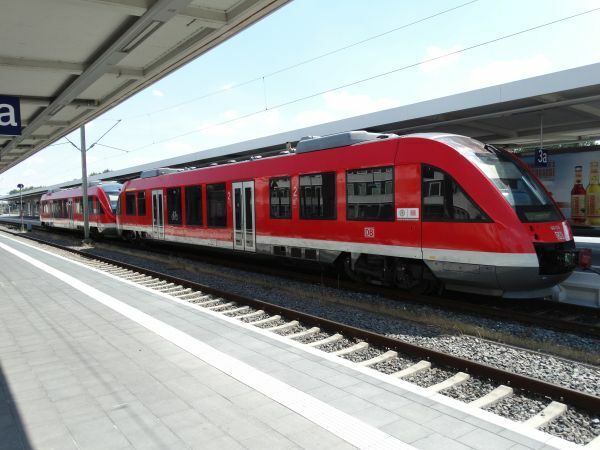 Two RegioShuttle RS1 railbuses of DB subsidiary RAB (DB ZugBus Regionalverkehr Alb-Bodensee) at Ulm station. RegioShuttle was developed by the company ADtranz, but after its insolvency, the rights were transferred to the Swiss company Stadler. Stadler has developed this model into a real success, especially within the market segment of small private rail companies. It's rare though to see an RS1 in DB red. Picture from Ulm 13.9.2016 by Ilkka Siissalo. The class 611 was not a success. First DB bought actively tilting diesel trains, so called RegioPendolinos, from the Italian Fiat. They became the DB class 610. When DB wanted more of them, a public tendering was arranged and it was won not by Fiat, but by an East German factory which by then was called LEW Hennigsdorf. It was the time right after German reunification and for the politicians it was important to get more work for the people in the east, so a contract was signed. But the Br 611 has become famous for its constant defects and noisiness and even when it is working, some people complain that one becomes seasick because of its too active active tilting. But they still existed until at least the end of 2018. The Fiat class 610 is already out of service since a long time. Same train as above. The actively tilting Br 611 was a typical product of the early 1990s. Still the same Br 611 train seen from the other side. 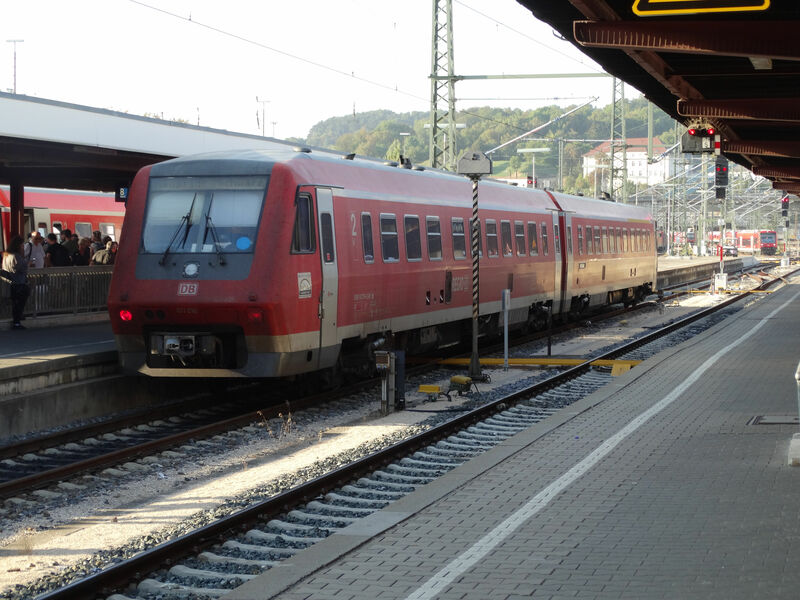 This is an UBB, Usedomer Bäderbahn, railbus of the DB class 646, which is a Swiss Stadler built GTW 2/6. The UBB is a daughter company of DB and it operated the Bäderbahn or "railway for the bathers" along the sandy shorelines of the famous holiday island of Usedom on the Baltic sea coast of eastern Germany. Picture from Seebad Ahlbeck station 2.7.2013 by Ilkka Siissalo. In pre-war Germany speed was very important for the Nazi government. German Reichsbahn DRG built a series of very fast diesel trains which were classed as SVT 137. There were four subclasses of these very fast trains. This one, SVT 137.225 is of the so called Bauart Hamburg subclass. It was a two section railbus with Jacobs bogies, had a power rating on 604kW and a maximum speed of 160 km/h. These were used in the Berlin to Hamburg traffic. 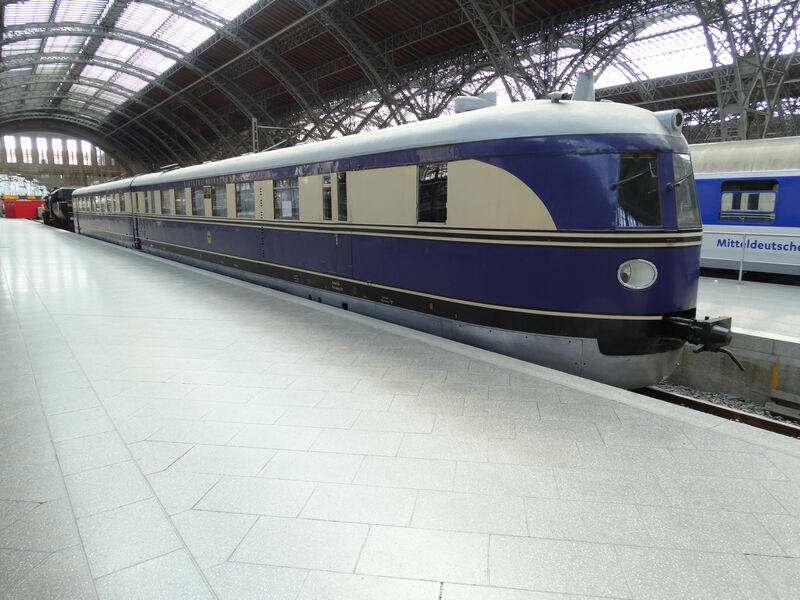 After the war this one ended up in communist DDR and served there as a special train of the top state politicians. Now it is restored to its original paintings and is kept as a memorial at Leipzig main station. Same SVT 137 as above, but seen from the other side. More memories from times gone by. These Br614 trains do not exist any more, except for I believe two examples in railway museums in Germany. But these were really commonplace once. This Br614 diesel multiple unit is a direct successor and technically very similar with the earlier Br624 (note that the numbering does NOT give any idea of what is newer or older !). These had MAN engines and were built together with MAN and Uerdinger Waggonfabrik. Production began in 1973 and they were originally designed for actively tilting bogies -that's why the chassis is narrower towards the roof. Most of these trains were stationed at Braunschweig, Nürnberg or Trier. They were all taken out of service until 2010. Picture from Braunschweig Hbf 22.7.2004 by Ilkka Siissalo.